Answer: How long is it? Image of Ball's Pyramid from Wikimedia. Most people found part 1 to be pretty straightforward. 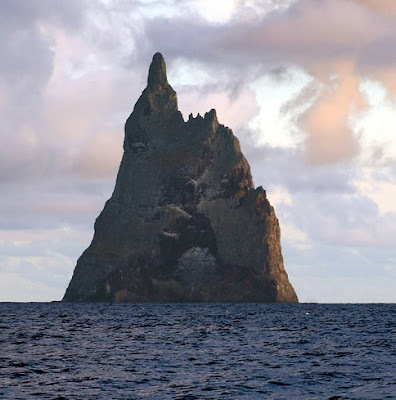 A query like [large insect island] quickly leads to the NPR story by Robert Krulwich about the Lord Howe's Walking Stick that ran just a few weeks ago... unfortunately for me as that article (which is a great story!) made this search a bit TOO simple. From the Krulwich report that you can read the story of how the S. S. Makambo ran aground Lord Howe's island in 1918. If you do a few searches to second source his story, you can find lots of supporting evidence. (It's not that I don't trust Robert Krulwich, it's just that I check almost everything.) Rats from the ship went ashore on Lord Howe's island and wiped out the insects pretty quickly. A sadly common story throughout much of the South Pacific islands--invading species destroys endemic animals and plants. The second question, though, is a bit more difficult. Several readers did a smart thing and used the scientific name of the insect to search for more biological information. This is a good strategy to remember: When you're searching for detailed scientific data, you usually want to use the binomial version of the name (that is, the pattern is Genus species, the scientific Latinate version of the animal's name). In this case, it's Dryococelus australis, the Lord Howe's Walking Stick. So a quick search for [Dryococelus australis nymph size] (or [... hatchling size]) quickly leads you to the remarkable (and very unexpected) Husbandry Manual for the Lord Howe Island Stick Insect issued by Australasian Society for Zookeeping. Yes, there are a group of people who have collected all known information about how to raise and keep these insects happily in captivity. In that text, the following sentence appears (this has got to be one of my favorite sentences in all the scientific literature): "LHISI nymphs measure approximately 20mm on hatching, varying between 16-22mm. They emerge from the egg usually underground, and burrow to the surface to climb the nearest large object. If kept in Chinese takeaway containers they will always be found clinging to the underside of the lid." 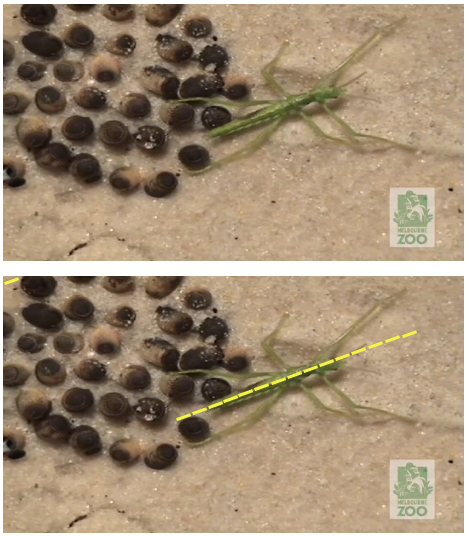 I grabbed one of the final frames from the video and measured the insect in terms of "operculum widths." Each little yellow line in the second image is around 1 operculum width (as estimated from the same image) and then drawn atop the newly hatched nymph. As you can see, the body is 8 operculums (opercula?) long, and 15 operculums from tip to toe. If each operculum is 3.6mm, that means the body is 8 * 3.6mm = 28.8 mm (1.1 inches) and overall it is 15 * 3.6mm = 54mm (2.1 inches). No matter how you look at it, that's one big insect out of an egg that's the "size and shape of a TicTac." 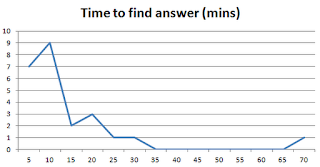 The average time to solve this challenge was 13.0 minutes; the median time was 10.0 minutes. But what's always interesting to me (in addition to the amount of time it takes) are the answers we see in the comments. 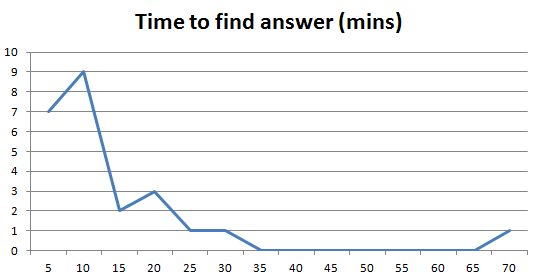 Here's the distribution of answers given by the commentors. You can see that we could probably check our work a bit better! There seems to be three sources of errors here. 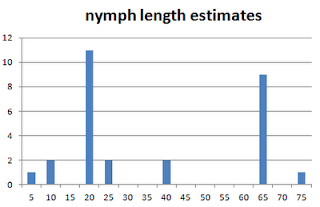 (3) eyeballing a length estimate off the image from the video. Additional reading: Gurney, A.B. 1947. Notes on some remarkable Australasian walkingsticks, including a synopsis of the genus Extatosoma (Orthoptera: Phasmatidae). Annals of the Entomological Society of America 40(3): 373-396. 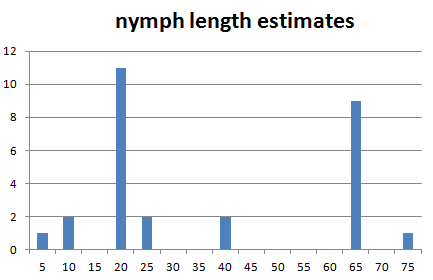 Wednesday search challenge (3/28/12): How long is it? Today's challenge is exotic and amazing. It seems prosaic when I state it, but the search really is worth the trouble. Trust me on this one. A little background info to get you started. I'm interested in a particular insect, a kind of walking stick that lives in only one place in the world. (On the fantastic island pictured below. It's a real place.) Except that wasn't always true. It used to live on two islands side-by-side somewhere in the Pacific. Thing is, a ship ran aground on one of the two islands causing this particular insect to become extinct. Luckily, it went extinct on one of the islands and not the other. Why do you care? Aside from the usual important issues around loss of biodiversity, the insect is extraordinary. It's huge. Scarily huge. Jurassic park huge... and it's still around. But today's question is really two-fold. As usual, be sure to let us know how you figured out the answers to these questions AND how long it took you! As several readers pointed out in the comments, my analysis didn’t REALLY answer the question I’d asked. They were correct. Thanks for picking up on this. I found the languages by COUNTRY, then added up ALL the languages spoken in the country. That’s not what I asked for! I wanted the TOTAL number of unique languages spoken in each hemisphere. Okay. Let’s do this again. Better this time. 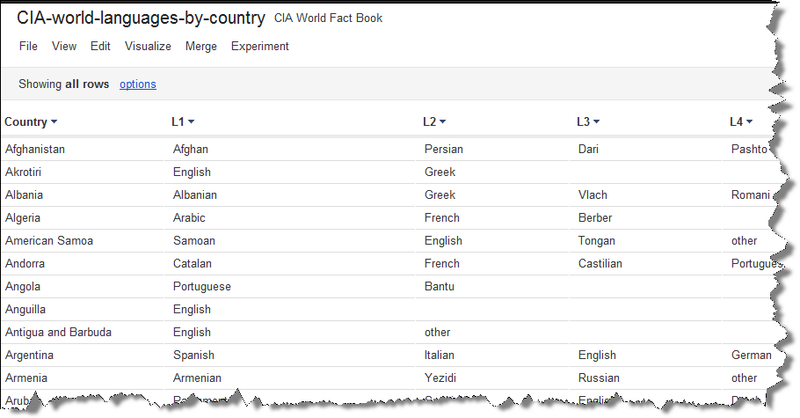 This time I pulled the list of languages from the CIA World Fact book page on languages of the world. I copied it from the web page and pasted it as plain text into a .TXT file. 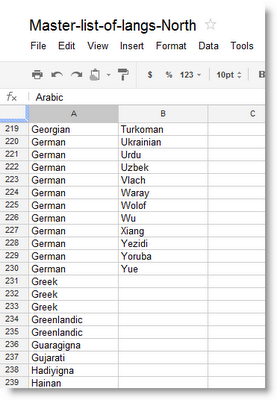 This gave me a simple spreadsheet with country names in the left column and columns of languages to the right. HOWEVER… I now had to do some data cleaning. Many of the language entries had comments (e.g., percentages of speakers of that language in the country) scattered throughout the listing. They’re useful for readers of the language list, but not helpful for the data analyst. Then exported THAT fusion table as a regular spreadsheet so I could easily select the rows that are below the equator (that is, that have a latitude with an “S” in them). Next I sorted by latitude, then copied all of the languages BELOW the equator into a simple text file (which I then imported into a spreadsheet) so I could remove duplicates easily with a spreadsheet function. In Google Spreadsheets, that’s the UNIQUE function. This step gave me the Master list of Southern Languages. 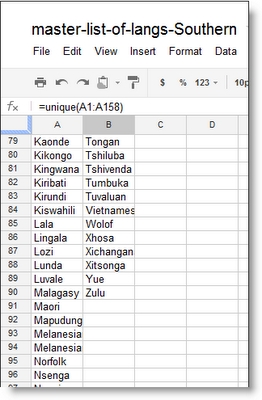 Did the same thing with the languages ABOVE the equator and created a spreadsheet Master List of Northern Languages. Once again I used the unique function to identify the unique languages. Now I can read off the numbers: the Southern Hemisphere has 90 unique languages, while the Northern Hemisphere has 230 unique languages. Lesson learned: Doing these kinds of analyses can sometimes be tricky, even when you write the question! One of the great things about writing a blog like this is that there are so many smarter-than-you people out there! More than a few people wrote in to comment that either I'd done the analysis incorrectly (which is kinda true), and that I hadn't posted my spreadsheets in a public place (clearly true). A few wrote in to complain that this data point or that data point wasn't right. And some of them have a point... but I don't think it will matter in the end. In any case, I'm travelling right now and wanted to let you know I haven't forgotten this analysis. I'll try to get to it this evening, righting the wrongs in my spreadsheet and talking about why and how such analyses sometimes goes awry! If a source (such as a newspaper or web site) never publishes and erratum, you know they don't care much about how right they are. Finding admissions and corrections of errors is a HUGE positive sign that the source is credible. Answer: Are there more languages ABOVE or BELOW the Equator? Are there more languages ABOVE the Equator or BELOW the Equator? As I said, a big part of answering questions like this is making your terms very clear. When we decide to consider only “Official” languages, and not, say, every small language spoken in New Guinea (which has thousands) or every language spoken in central Africa (more thousands), we REALLY simplify the problem. What this lets us do is search for a list of “Official languages.” So just doing a search like [official languages] quickly leads to the Wikipedia page of OfficialLanguages. And that's not a bad place to start. Now I need to figure out which of these countries have their capital in the northern hemisphere. 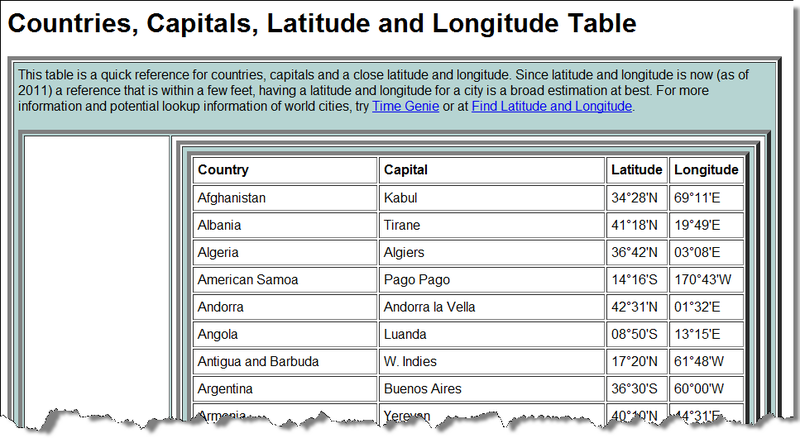 So I THEN did a search for [ country capitals latlong ] and found another handy table of country capitals with their associated lat-longs! I did the copy/paste to get this data from their web page into my plain text file. I then imported that into another spreadsheet. Now I’ve got two spreadsheets, one with a list of languages-by-country, and another with country-capitals and their lat-longs. 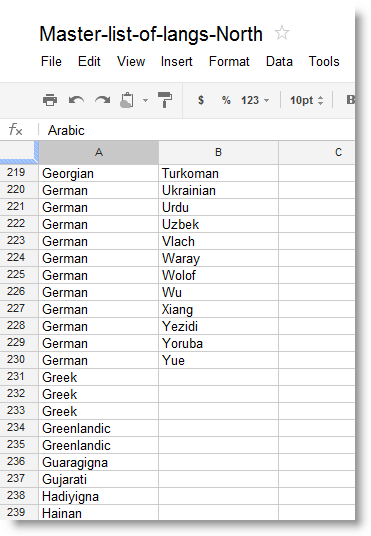 From the Lang-by-country spreadsheet I can easily write a spreadsheet function to count the number of languages in each country. The 199 languages of each country in this table are separated by commas. 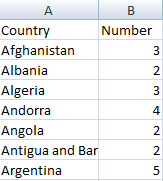 So, I write a short spreadsheet function to count commas in each row, and—voila!—I have a table of Country / Number-of-languages. (I’m happy to let the phrase “…other Turkic and minor languages” be counted as 1 extra language. You'll see it won't matter in the end.) By this method, I see that Afghanistan has 3 languages. Yes, there are others, but there are only 2 official languages (and many non-official languages). 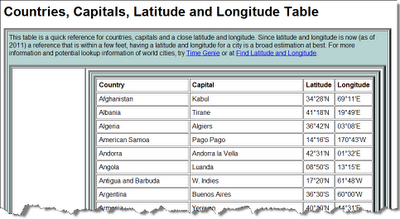 In my other spreadsheet I have a table of 200 Country / Capital / Lat-longs. 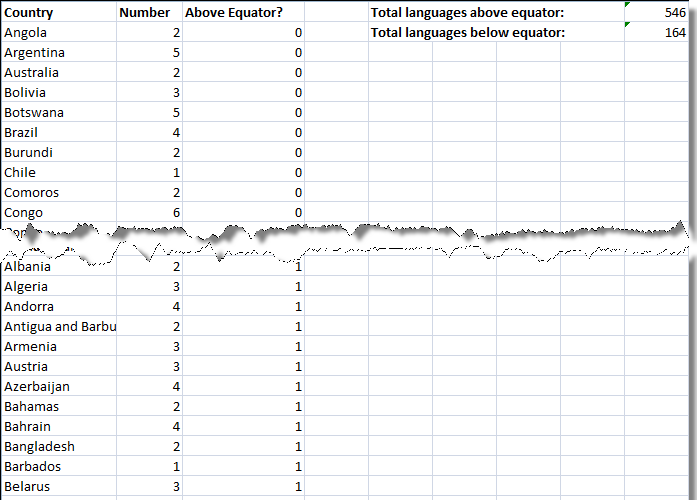 Obviously what I want to do is to use the Lat-longs to determine if the country is ABOVE or BELOW the equator, and then just count the number of languages in each group. This is exactly what Google Fusion Tables are designed to do. 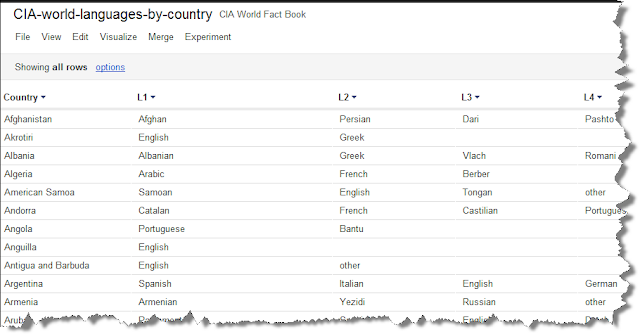 A Fusion Table can take two different tables that share a common element (in this case, the column labeled “Country”) and JOIN them together. That’s 200 copy/paste operations I won’t have to do by hand. I created two Fusion Tables, one for each of my two spreadsheets. 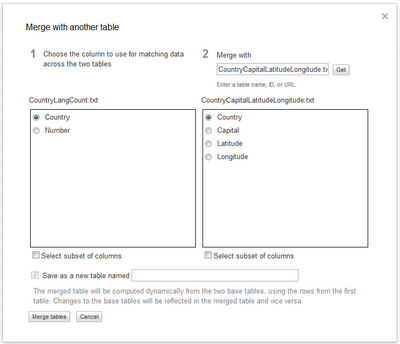 Using Fusion Tables "Merge" function, I just joined them together on their shared column "Country." 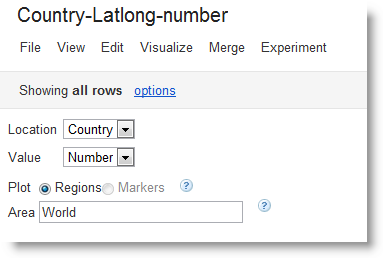 I opened the Country-LatLong table and then FUSED it with the Country-Language-Count table. 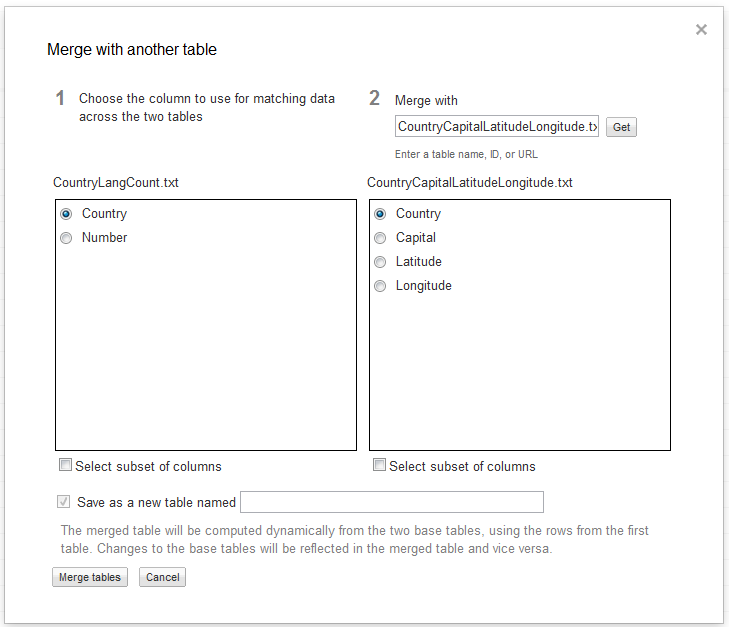 This basically merges the two tables so that I now have new table with columns for Country / Lat-long / Number of languages! Once I have this, it’s an easy sort of the table to put all of the countries above the equator (that is, their Lat-long contains an “N” in the entry), and then write a simple =SUM(…) function to add them all up. Here’s what my table looks like now. I converted the presence/absence of an “N” in the lat-long into a 1 (for ABOVE) or 0 (for BELOW). And now we can just read off the answer: There are 546 official languages spoken above the equator, but only 164 spoken below. That’s a big difference. I’ll leave it to you to speculate why that is. But at least we’ve got a little data to go on. And, since I was in Fusion Tables, it was trivial to visualize the data by mapping the number of languages onto the map-of-the-world and create this map. The darker the green, the more languages spoken there. As you can see, the north has a LOT more than the south. SEARCH LESSON: Often you’ll find that data is out there on the web, but it’s in an un-handy form. In this case, the information we wanted wasn’t immediately available. But with a little data extraction, spreadsheet jockeying and using Fusion Tables to merge two data sets, we can get to what we want fairly quickly. Keep your eyes open for these data-merge possibilities. Once you start looking around, you’ll see all kinds of merging that leads to insights about the world. 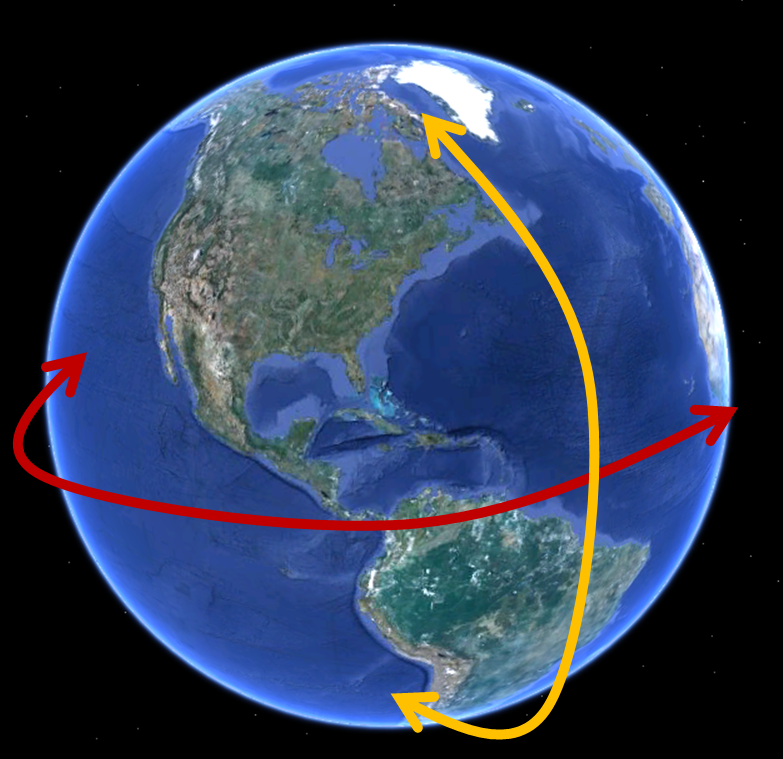 Wednesday Search Challenge (3/21/12): Are there more languages above or below the equator? But then the discussion grew a bit more heated... Did languages arise because of geographic isolation, did they come about because of drift over time, or... what? A big part of answering questions like this is making your terms very clear. For this question, let's consider only Official languages (that is, languages recognized by the country) and not worry about relative sizes of speakers. 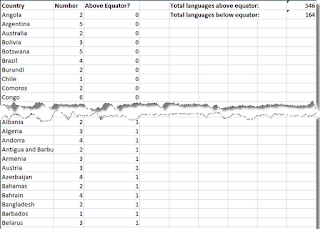 We're just interested in whether or not countries below the Equator have more languages than those above the Equator. To take an example, we know Switzerland has four "official" languages (German, French, Italian and Romansch). Romansch has been recognized as one of four "national languages" by the Swiss Federal Constitution since 1938. So, once you figure out what the languages of all the world's countries are, and divide them into languages spoken above-equator and below-equator, you'll be set to give the answer. Notice that some languages (such as French or English) are spoken both above and below the Equator. And for countries that straddle the Equator, let's go with the location of the capital as deciding if the country is above or below. Thus, Ecuador (capital: Quito, at 0° 9′ 0″ S, 78° 21′ 0″ W) is in the southern hemisphere. Obviously, you don't want to do this one country or one language at a time, so the real question is... HOW will you do this? As usual, please let us know your answer, HOW you figured it out, and HOW LONG it took for you to figure this out! More above or below? The ideal solution will actually determine some way of measuring this directly from data available on the web. Answer: Where's that cat with the Mai Tai? +37° 52' 25.55", -122° 15' 34.36"
And now... how to find it: Here's what I really did... 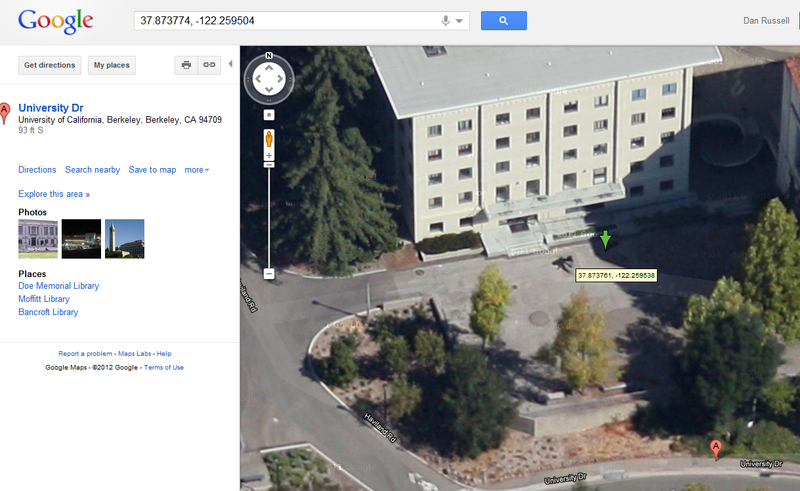 Given that the picture was pretty high res, I just zoomed in and read the plaque at the bottom of the statue. Duh. But in a search challenge, every clue is fair game. Once you zoom in enough you can read it was sculpted by Vic Bergeron, which seems like a pretty obvious clue. A quick search for [ Vic Bergeron Mai Tai ] and you'll find many articles (including the Wikipedia entry about Trader Vic's) that argue that he was at least one of the two people who claimed to have invented the Mai Tai (the other person being Donn Beach, of "Don the Beachcomber" fame). "...The saber-toothed cat, Smilodon californicus, whose likeness menaces the southern entrance to the building, is the official California State Fossil. It was sculpted by Victor Bergeron (of Trader Vic's fame) who is more widely known around the globe for his Mai Tai than for his sculptures..."
I have to admit to being surprised by a few of the answers submitted by readers. 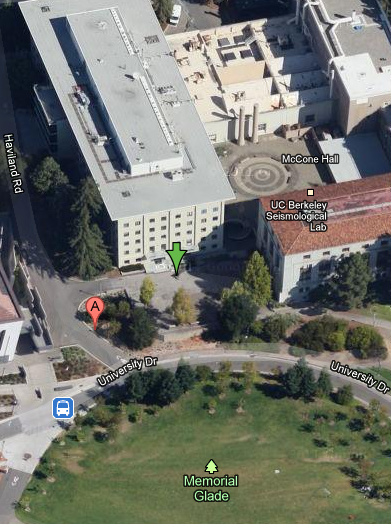 Who knew, for instance, that doing a query for [Sabre Toothed Cat, University Drive, Berkeley, CA] in Google Maps would work? Nice discovery. Using the lat/long from above, these are the best aerial images I could find. BTW, you CAN extract the lat/long from the link, but it's much better if you install the lat/long tool in Maps, then just right-click on any point in the map to capture the exact lat/long location. Most people reported finding this one in less than 10 minutes. Next week, we'll go back to harder questions! Get ready! Wednesday search challenge (3/14/12): Where's that cat with the Mai Tai? I was wandering around the Bay area and came across a remarkable statue. 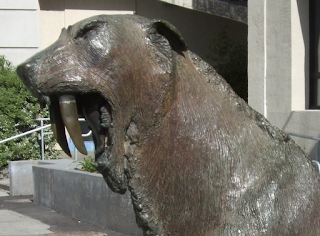 Even more amazingly, once I saw it, I realized that this bronze cat has a deep connection to that rum concoction known as the Mai Tai. Given just the photos shown here, you should be able to figure out what the connection is. Can you? What possible connection can there be between this statue and a rum drink? For extra credit, you should be able to easily determine the lat/long of the statue. Can you find an aerial image of the cat? Answer: Fishing over your head? 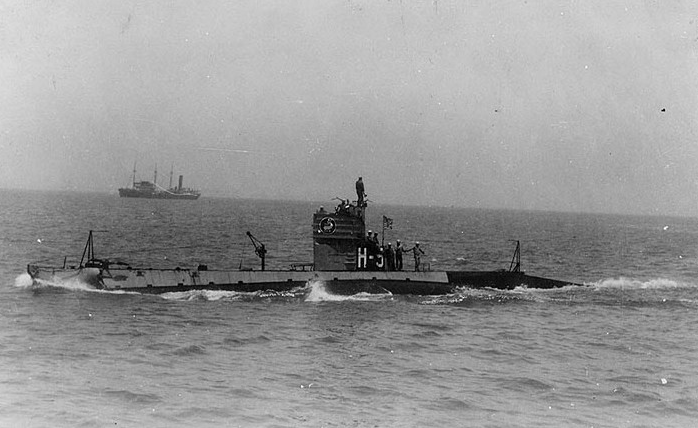 Short answer: The submarine H-5 (USS-148) was at least occasionally used for fishing by submariners who would attach fishing line, hooks, bait, and floats to the top deck. As the submarine trolled underwater, the fishing gear would do its work and the sailors would collect their catch upon resurfacing. In this way, all of the fishing tackle was ABOVE the sailors, as were the fish themselves! And surprisingly enough, the submarine was originally built for the Russian government! But she was never delivered, and spent the rest of its days operating out of the San Pedro (California) sub base. How to search for this: I knew this was out there somewhere, and tried a bunch of combinations of searches [ overhead fishing ] then [ upside-down fishing ] and similar kinds of queries, ultimately leading nowhere. I probably spent about 5 minutes trying out different combinations, getting nowhere. I then sat back in my chair and thought about the situation, trying to imagine what it might look like. What set of circumstances could possibly lead to fish being overhead? Then I had an insight that was crucial. Maybe the fishermen were in a submarine! It sounded crazy to me, but I did the quick search [ submarine fishing ] and discovered at the 9th result place a link to Fishing History... and fishing from subs. To tell the truth, this looked a bit too much like a bit of fake news. (There are a number of people who fake old news stories to look just like this.) So I really wanted to check the original source. How could I do that? 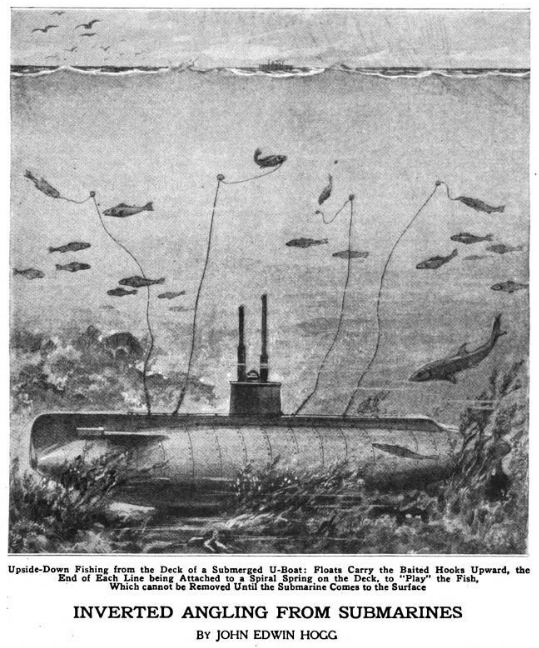 The article claimed it was from Popular Mechanics in the 1920s… so I just popped [submarine fishing Popular Mechanics 1920] into my search box and quickly found that Google Books HAS Popular Mechanics (but the article itself wasn’t showing up on the first couple of pages). So I went to Google Books and repeated my query. 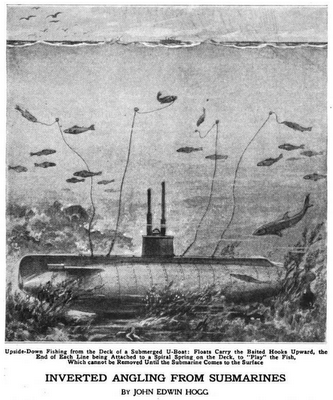 [Popular Mechanics submarine fishing 1920] Now that my query is scoped (that is, just limited to) Google Books (and therefore, Google Magazines as well), I found the original story by John Edwin Hogg from Popular Mechanics magazine, volume 34, 1920, p 591-592. The Wikipedia article on the H-5 gets right to the point, and incorporates text from the History.Navy.mil web site, which is presumably the most authoritative source you can get on US naval vessels. The H-5 was built for the Russian Imperial navy during the First World War in 1915 at the Electric Boat company in Groton, CT (now known at the General Dynamics Electric Boat Company), but H-5 was never delivered due to the Russian Revolution of 1917. 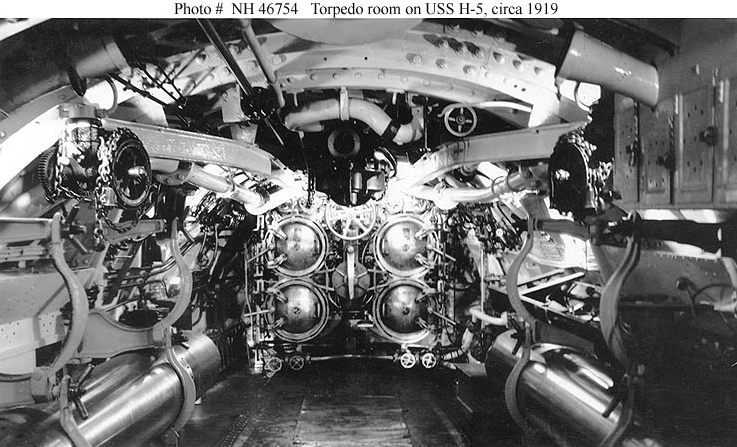 Amazingly, I found quite a number of photos of the H-5 on the Navy.mil site, including interior shots showing the torpedo tubes and the “fish” the H-5 carried. Although the H-5 had “fish” (torpedos) onboard, that wasn’t the fish I was seeking. And, if you visit the website, you’ll see that the photographs were taken by none other than John Edwin Hogg, the author of the Popular Mechanics article! It seems that Mr. Hogg was an enterprising writer. At least he did his research! Search lessons: This week, the lesson is that you sometimes have to step back and re-think what it is you’re searching for. Once I got the idea that the only way to fish OVERHEAD was from a submarine, I added that term to my search, and everything immediately fell into place. As crazy as it sounds, yes, anglers can fish from subs. Once you add that key term into the search, everything works. Wednesday Search Challenge (3/7/12): Fishing over your head? One of the most remarkable stories in the annals of fishing is the tale of one particular boat that let anglers fish in a way that was completely unexpected. While the fishermen relaxed or did other chores, their hooks, lines and floats would be well over their heads. I don’t mean this metaphorically, I mean it literally—the fishing gear would be many tens of feet above them... and the fish as well! There was one particular boat that became best known for this style of odd “fishing above the head.” Can you find the name of that boat AND who the boat was originally built for? As usual, be sure to say what queries you used to find the answer and tell us how long it took you to discover the story behind "fishing over your head"! I often have this feeling of “we must go deeper” when I’m doing a simple search for information on Google—and yet I’m surprised when I see that other people don’t seem to have that same urge to understand what’s really going on, but are satisfied with the first answer that pops to the top. Somewhere along the way I must have developed a fact-checker’s outlook. You know who the fact-checkers are: they’re the woefully underpaid people who read news, books, and magazine articles pre-press and meticulously verify that what’s written actually lines up with observable reality. They’re paid to not just lookup the original publication of a fact, but then to also follow-up with the next few issues to see if any retraction or correction was published. That’s what a real fact-checker does. Running down truth, even if it takes several extra steps. When I talk to students as they search for simple facts, I find that they just want to get an answer that’s plausibly correct. The actual truth of a fact doesn’t seem to matter as much as it confirms something previously known, or is merely close to something plausible. It’s as though they live in an ongoing game of horseshoes where getting your token close to the post is often good enough to win. The thing that worries me these days is that not only do students not want to second source a reference (let alone look for retractions or corrections), but they often don’t want to understand the topic in enough detail to know how-and-why their fact might be incorrect. The simplest example I can think of is the straight-forward question “What’s the circumference of the earth?” How hard could finding that be? It IS the case that if you do a quick Google search, you can quickly end up with a very credible looking answer. Here’s one answer: 24,901.55 measured around the equator (red arrow). But here’s another: 24,859.82 miles if you measure around the poles (yellow arrow). And of course, you can get different sets of number depending on who made the measurement, how it was made, and according to what model of the earth they’re using. Now wait a second! How does “model of the earth” enter into this discussion? Isn’t the circumference an actual physical measurement? But here’s the tricky part: If you measure some fraction of the earth’s surface, you then drop that into a MODEL of the earth to compute the circumference. If you assume the Earth is a sphere, then it’s just simple geometry. But the truth is, you have to know that the earth isn’t a sphere. (I assume you know that!) But if it’s not a sphere, then what IS it? That’s where the model comes in. Newton thought the earth was an oblate spheroid (a sphere that’s been squashed down a bit) with a flattening of 1:230 from truly spherical. He derived that ratio from his model of gravity, and brilliant though it was to figure that out, it’s not quite right. Measurements later showed that the flattening is more like 1:210. The model of Earth as oblate spheroid assumes that it’s a “body of revolution.” That doesn’t mean it suffers from constant political uprisings, but means the model assumes it’s pretty smooth, as though it were turned on a lathe. Of course, you know by now that nothing is that simple. Earth is actually fairly lumpy, with bumps on it—think Rocky Mountains or Himalayas—or low spots like Death Valley. So a better model is complex ellipsoid with various undulations that make it NOT a body of revolution. The real question is probably this: Why should I care? The two numbers given above (24,901.55/ 24,859.82) are within 1% of each other. Does that matter? Thing is, this is true for most things you look up. Suppose someone asks “what’s the biggest city on Earth?” A quick Google check shows that it’s Shanghai with 17,836,133 people. Really? Since the time you started reading this, some people died in Shanghai while others were born. What does the instantaneous population of a city even mean? And so checking the backstory quickly leads to clarifying questions: “What do you mean by biggest?” Are you measuring population or area? Do you mean city boundary as determined by the city council or by measuring the urban core and excluding suburban regions? This is, of course, what reference librarians do—they conduct the “reference interview” to try and pin down the variable parts of someone’s question. But then a graduate student asked for a “list of the top ten journals in Sociology.” He wanted to get a general awareness of what the field was about and what would be reasonable topics of current interest. Getting a list of sociology journals isn’t hard. Rank ordering them according to some reasonable function is tough. “What would you like?” I asked. “Readership size? Citation rates? Agreed-upon influence? Most-often-checked-out?” Those all produce somewhat different sort orders. Thing was, he didn’t really care. He didn’t need an ordered list—just ANY list of 10 good journals would be fine, thanks very much. I’d just assumed that he wanted an ordered list. That’s what working at Google does to you; I see the world as a ranking problem and just assumed he wanted a list with an evaluation. But since he was going to spend as much time with journal #1 as with journal #10, it really didn’t matter. Any good psychologist will tell you that “the presenting problem is often not the root problem.” Likewise, the first question is often not the real question. Good searchers take a problem and worry on it a little. Good searchers look behind the “answer” to understand how that answer came to be. In the circumference case, it was the measurement method. In the population problem, it was how “largest” was defined and then how that property was measured as well. If I could somehow give everyone a piece of search advice, I’d say “think like a fact-checker” and get one or two steps deeper into your topic matter. You must go deeper in order to understand what it is you think you’ve found. The fact you seek isn’t just a fact, but something based on a set of choices about how to measure and what to report. Of course, I can say this all I want. But this approach hasn’t worked well in the past. (People have been saying this for a long, long time.) How can I help people see this is what they really want to do when they really want to understand a topic? This search challenge was harder than I thought… but for an interesting reason. I’ll take the blame here—the question (“English 4-word idiomatic expression for something thought to be impossible, but shown to be trivial”) is not exactly a cleanly defined, clearly answerable kind of question! As a consequence, people found all KINDS of answers that I hadn’t thought about. Alas, while many are close, they’re not exactly right. “Cutting the Gordian knot” has the right sense of a sudden rapid solution to an unsolvable problem. As you can see, writing a nice, hard search problem that has a neat, instantly recognizable solution is tricky. JacobM solved the problem by searching for [ seems | looks impossible ] (where the vetical bar symbol means OR). He found some idiom collections and flipped through them until finding the right one. This is a really good approach! In the comments, Johns1111 points out that in German this would be “das Ei des Kolumbus,” which is a transliteration of “The Egg of Columbus,” and, in my opinion, quite correct. Congrats also to Amarek for also finding the same solution. The Back Story to this problem: This problem was originally given to me by a friend who knew that such a phrase existed, but he couldn’t think of what it was. If it makes you feel any better, I worked on-and-off on this question for about 4 weeks, trying new ways to search for it… basically looking for a way to rephrase the question so that the results would contain the answer. My reasoning was that someone writing about this idiom would have to use the phrase after the fact and use that phrase in the context of discovering an easy solution. That's how I chose my search terms. Luckily, it worked out well. But truthfully, only after a lot of systematic search on my part. The Wikipedia entry for "Egg of Columbus" has the following explanation for the phrase which I like. The Egg of Columbus story might have begun with the Italian historian Girolamo Benzoni. In his book History of the New World (1565) he wrote: Columbus was dining with many Spanish nobles when one of them said: 'Sir Christopher, even if your lordship had not discovered the Indies, there would have been, here in Spain which is a country abundant with great men knowledgeable in cosmography and literature, one who would have started a similar adventure with the same result.' Columbus did not respond to these words but asked for a whole egg to be brought to him. He placed it on the table and said: 'My lords, I will lay a wager with any of you that you are unable to make this egg stand on its end like I will do without any kind of help or aid.' They all tried without success and when the egg returned to Columbus, he tapped it gently on the table breaking it slightly and, with this, the egg stood on its end. All those present were confounded and understood what he meant: that once the feat has been done, anyone knows how to do it. 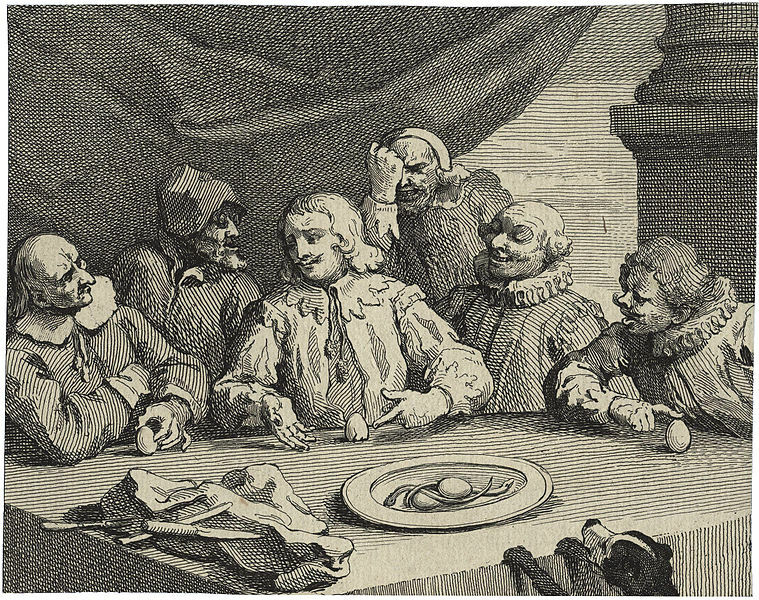 Image of Columbus breaking the egg, by William Hogarth. Original in National Portrait Gallery, London. This image from Wikipedia. Whether or not the story is true, it has entered into the world as an idiomatic expression for "seemingly impossible to solve, but actually trivial." An excellent idiom. Search lessons: (1) First, as should be obvious, finding idioms is hard. People who searched in idiom dictionaries were on to something. That’s a great strategy for searching out this kind of information. I tried a couple before giving up, hoping to stumble across it (which is what happened). (2) You sometimes have to search for the right query. I tried a lot of queries in my search (at least 100 over the 4 week period) before I found the right combination of search terms that led me to the answer. I was really interested (which is why I dedicated so much time to the problem). My big tip about long searches is pretty simple: Keep track of what you’ve searched for and found. That’s especially true for long search processes that take weeks. I just kept an open text file with my “search notes” in it. It really prevented me from duplicating my searches and let me systematically eliminate possibilities.